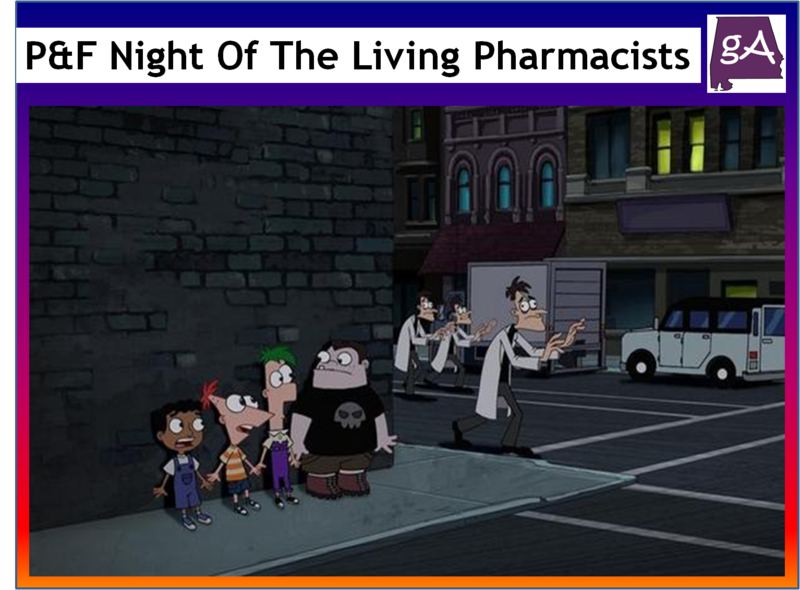 Over the weekend, Disney Channel premiered Star Wars Rebels, but they also premiered the new Phineas and Ferb Halloween special called Night of the Living Pharmacists. The special was in my opinion one of the best specials in the Phineas and Ferb franchise, it was just too good! If you like The Walking Dead, Night Of The Living Dead, or Shaun Of The Dead, you are going to like this Phineas and Ferb special! Here is a special clip featuring Simon Pegg and Nick Frost, and yeah, they are turned into Doof-zombies. The special involved the kids building this contraption where they are rubberized and they bounce around. At Dr. Doofenshmirtz’s, his latest “inator”, fires onto the mayor and his older brother, which turns him into a Doof-zombie. And the infection rate is critical, if a Doof-zombie touches you, you turn into a Doof-zombie too! And the only catch phrase from the zombies is “lots of me.” No growls, no biting and eating other people, just saying “lots of me” and walking around with your arms straight out. Yeah, it does not take long for most of Danville to become zombies. 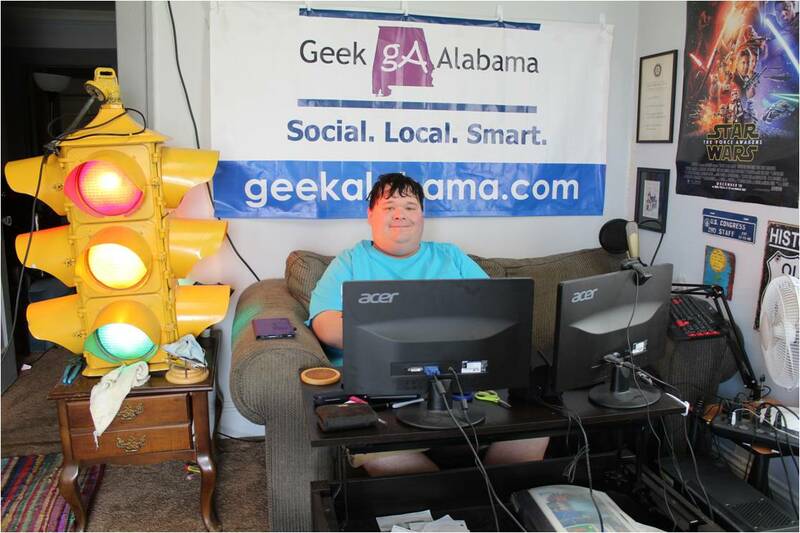 The special also includes the voices of George Romero, Noah Wyle, and Bella Thorne. And the voice talent was great as always in this special. There are numerous Easter Eggs and humor moments in this special, from Stacy not realizing there is a crisis going on, to the newsstand employee celebrating all technology going down. You have to re-watch the special to catch all of the moments again. There are also a couple of great songs in the special, I really liked the one about trigonometry, see kids cartoons can be smart too! The special even includes the animals from the OWCA turning into Doof like zombies as well. And boy, were the animal designs not too pleasant. I liked the transformation of Perry the Platypus into a doof-zombie, and saying “lots of me” in a platypus voice! 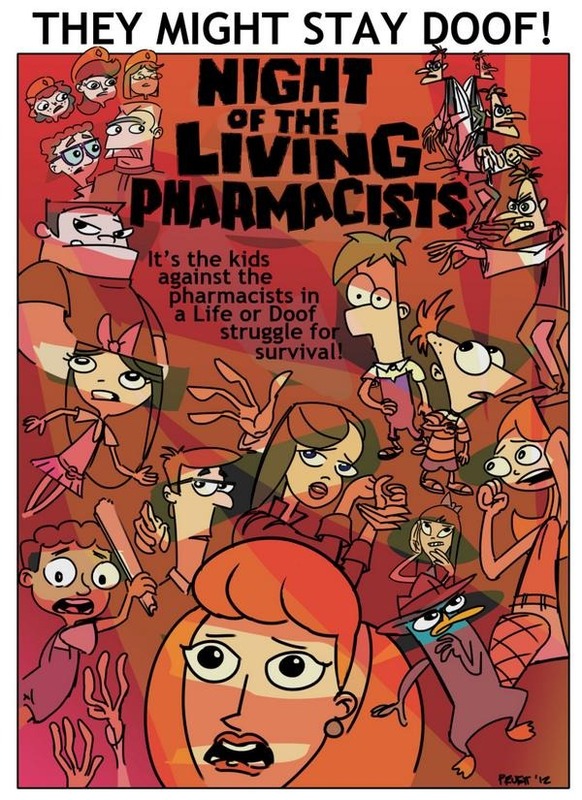 At the end, Isabella pushes a button to start a machine to spray water all across town, and this turns everyone back to normal, not before everyone including Phineas and Ferb are turned into Doof-zombies. In movies and shows like this, I always root for the zombies or the bad guys, as you know, this is a kids cartoon, so everything was going to be back to normal. But I like to think about what if the machine failed, and everyone remained Doof-zombies forever? This Halloween Phineas and Ferb special is something everyone in the family will enjoy! There’s no blood, no gore, only the characters becoming Doof-zombies and saying “lots of me.” You will enjoy the action, music, and comedy in the special. 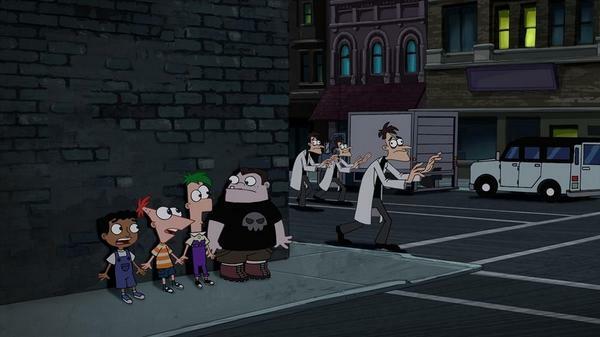 And yes, there was a Phineas and Isabella love moment, but the Doof-zombie transformations erased that part from their minds. Kudos to Dan Povenmire, Jeff “Swampy” Marsh, and the rest of the crew for making an excellent Halloween special! And to end this post, I am featuring a photo from writer and storyboard artist Joshua Pruett who made this great poster.